Weekend breakfasts in our house fall in two different camps: the hurried no time to stop or the let’s drag out the morning for as long as possible. The latter being much preferred when it’s a beach hut breakfast. However on either type of breakfast, granola can often be featured. Lately I’ve been feeling a tad miffed when it comes to paying crazy prices when buying a box of granola only to find it’s nearly all gone after a big family breakfast and it wasn’t cheap in the first place! So I thought surely I could make our own? After a few disasters (overcooking) I think I have found the answer. I’ve leant the secret is in the ratio of oats to fruit to nuts and seeds plus the cooking time. It’s a little like cooking cookies, you need to undercook and take out of the oven when just as its starting to colour. Anything more and you can’t save it and it’s fit or the bin. I like the amount of seeds and fruit to be quite high but not over the top and I do like the warmth from cinnamon. Come summer I might add less but this blend tastes heavenly when added to a fruit crumble topping. Of course you can change the type of dried fruit you use and change the seeds and used too but I find keeping to this ratio gives you the right amount of flavour and texture that shop bought varieties can’t. So far I haven’t added nuts but should you do, please let me know how it turns out. In a small saucepan, melt the coconut oil and add the remaining wet ingredients. Pour wet ingredients into the dry and mix well. Turn out on to two shallow baking trays and spread out. Place in the oven for 20 – 25 minutes and toss the granola every to ensure even cooking. Halfway through swap the trays over. Once cooled completely place into a large jar and this will keep for 8 weeks. Like baking cookies, it is best to remove the granola from the oven when it looks undercooked otherwise once at overcooked/tawny brown stage it is fit for the bin and nothing else! Here’s beach hut breakfast treat for you here – Egg Bacon, Cream Cheese Bagel. Such a coincidence I made granola this weekend and discovered it creates pure happiness! I added flaked almonds as well as seeds just because I had them and a little crunchy peanut butter too. It was so easy it will become a regular item in this house from now on. I love granola and this sounds amazing! 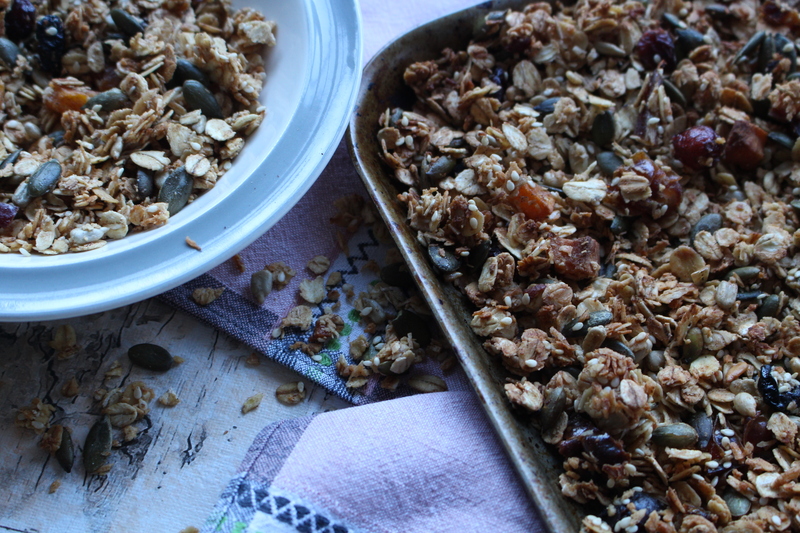 I love the idea of a homemade granola – not only does the house smell amazing! but you are in control of the ingredients! 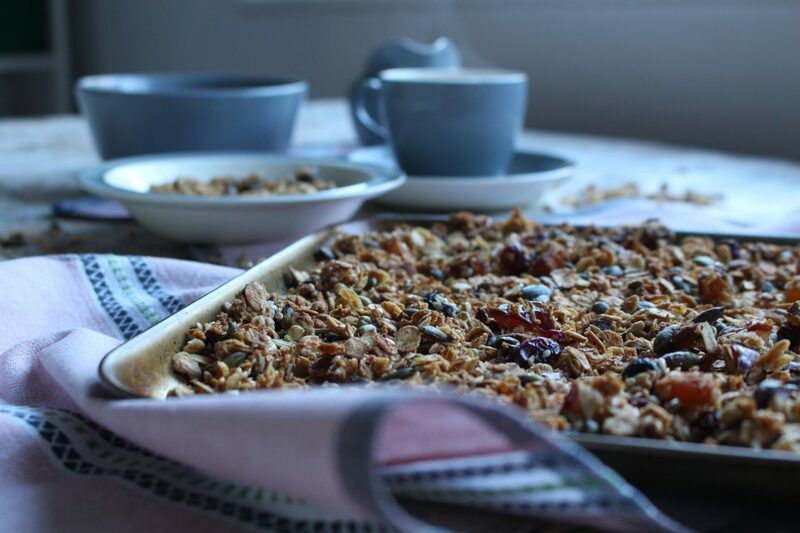 Oh my goodness this sounds absolutely delicious, I have to admit I love a good granola for breakfast, but I haven’t tried making my own, something I need to change this year. We love granola with yogurt. I need to try homemade as we do eat a lot of granola. This looks amazing! Thanks for the recipe, this will be our weekend breakfast! i want to make this tonight! So healthy and hearty!! 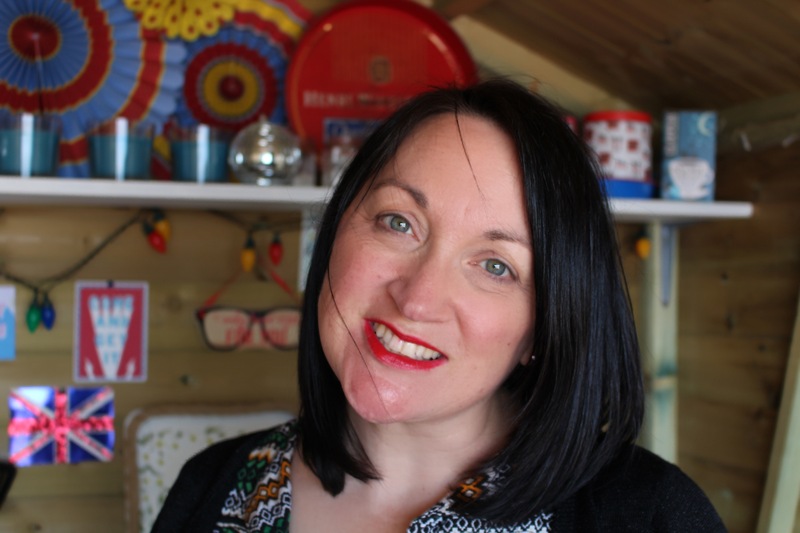 I love your comment “Winning at Breakfast” – some days that’s quite a feat! There’s nothing better than homemade granola for breakfast and I love the ingredients you’ve used in this recipe. Never really great with cooking. But my kids loves granola and this recipe is one of a kind. Can’t wait to cook this dish and have my kids say, “mom you’re the best”. Oh this looks so yummy and perfect for breakfast. Im going to try to make it next week with my kids. This looks delicious and satisfying at the same time. I also love granola for my breakfast! Thanks for sharing your recipe. I love homemade granola! 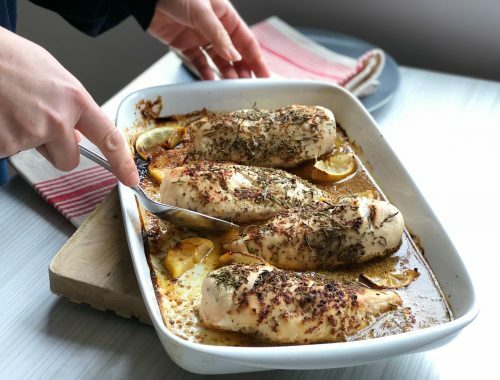 This looks like a simple but VERY tasty recipe! Now that is a tasty bowl of cereal. I love those ingredients. I absolutely love this! I would eat this every day if I could! What a fun and easy recipe full of nutrition and deliciousness! Great way to eat better! Oh this granola looks absolutely delicious! I actually have all these ingredients so I’m definitely making this asap. Love to have this granola with warm soymilk. yum! Oh this looks so very tasty! I love granola. 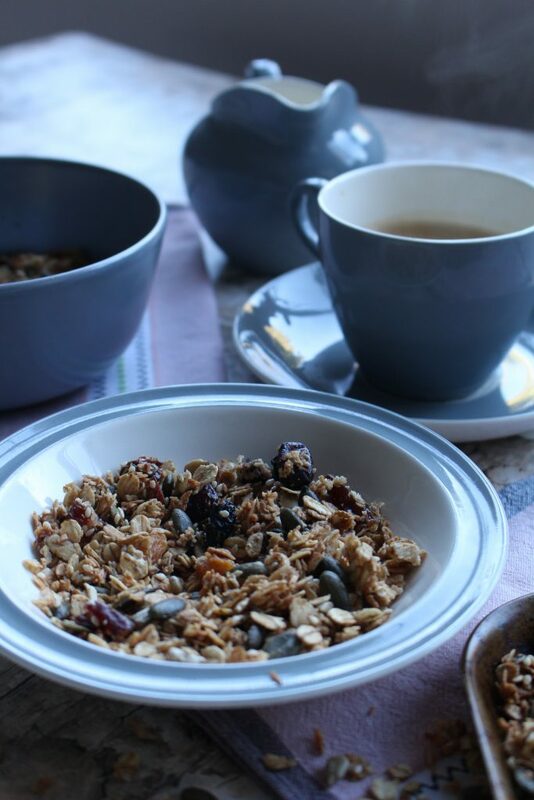 Oh, I really love granola so much and this recipe looks delicious and perfect for my breakfast. I will surely give this a try. Awesome way to nourish your body in the morning. Sounds good too. 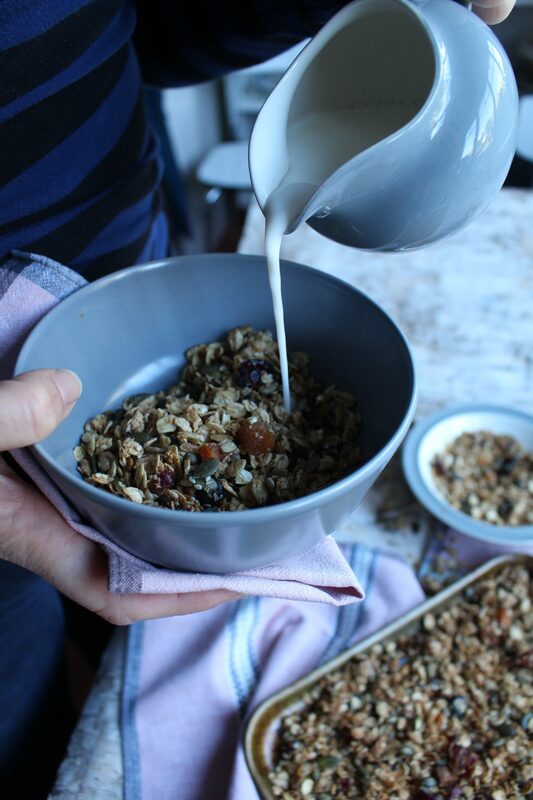 I’ve always hesitated to make my own granola but not any more! 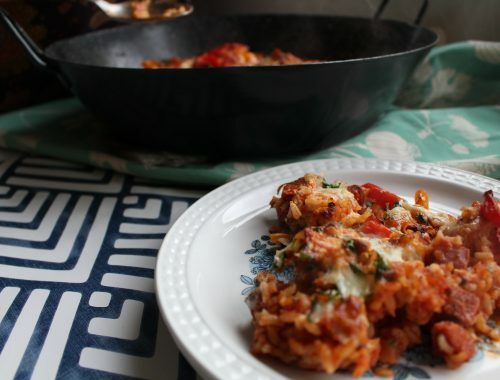 This recipe looks delicious and it’s got so many healthy ingredients. Thank you for the tip about removing it from the oven just before it’s cooked. 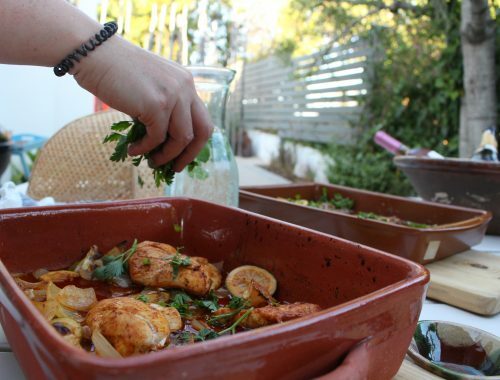 Thank you for sharing this post at the Hearth and Soul Link Party, Eleanor. Pinning and sharing! We have the same taste in granola. I make granola on a fairly regular basis too and these are a lot of my favorite ingredients to use. This looks soooo good! Not only would my family absolutely love this, the kids would love to participate in making it. Yum. Great recipe. I love that you have figured out how to make granola at home. This looks like it would be amazing. There really is nothing quite like homemade granola, I love how the whole house ends up smelling like it. This recipe looks and sounds divine! Yum! I love homemade granola so much. It’s quite easy to make. I love granola but never buy it because it almost always has raisins in and it’s so much nicer when it’s homemade. I was obsessed with it when I was breastfeeding my youngest and I was making batch after batch. Haven’t made it in a couple of years though. I love the fact yours doesn’t have any raisins in and maple syrup is one of my favourite things. x Thanks for joining in with #FreeFromFridays. I like granola especially homemade. The recipe is easy to follow, hopefully to treat myself with healthy stuff more often! I love homemade granola but really don’t make it as often as I should. I especially like all the seeds in this one! I am definitely making this! Sounds amazing, and any kind of variety at breakfast is right up my street. This looks great. I get so bored of breakfast and the same old options!